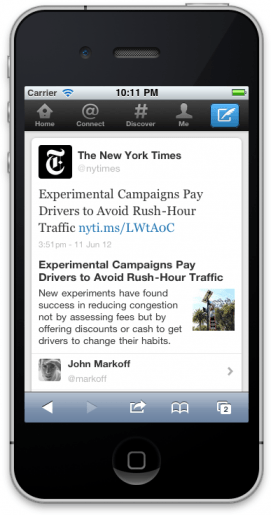 Twitter is building on their Expanded Tweets functionality by adding a wealth of new media partners to the program. Already in place for YouTube and Instagram content, Expanded Tweets allows a user to preview a link right on the site before clicking to leave the microblogging website. The service will let users see a preview of participating sites’ content that can include a story headline, introductory paragraph, byline, images and even video. The blog post announcing the added media partners lists plenty, including but not limited to The Wall Street Journal, Time, MSNBC, The New York Times, The Los Angeles Times, The San Francisco Chronicle, Der Spiegel Online, BuzzFeed and TMZ – and that’s just in the “news” category. Users who find content they like are encouraged to follow the account that posted it, reply, favorite or retweet the original Tweet. As GigaOm points out, Twitter appears to slowly be morphing into somewhat of a media company, despite their CEO claiming otherwise on multiple occasions. Case in point is the recent partnership with NASCAR that was designed to help fans find live Tweets about last weekend’s race. Other examples include Twitter working with the Super Bowl and Fox’s The X Factor to enhance the tweeting and viewing experience.